The Federal Trade Commission said nine dealerships had agreed to 20-year settlements after being charged with deceptive advertising, adding that more dealerships will face similar charges. "We have many other investigations in the pipeline," said Jessica Rich, director of the FTC's Bureau of Consumer Protection, at a press conference Thursday in Los Angeles. "This is a priority for the FTC and you will see many other cases in the auto-related area going forward. "There are many dealers who are honorable and want to treat their customers well," she said, "but we believe there are many more dealers out there who are involved in these deceptive practices." The FTC's investigation, announced in a statement Thursday, focused on the sale, financing and leasing of vehicles. The sweep was dubbed Operation Steer Clear. • Norm Reeves Honda Superstore in Cerritos, Calif.
• Nissan of South Atlanta in Morrow, Ga.
• Infiniti of Clarendon Hills in Clarendon Hills, Ill.
• Paramount Kia in Hickory, N.C.
• Fowlerville Ford in Fowlerville, Mich.
• Two used-only dealerships -- Casino Auto Sales of La Puente, Calif., and Rainbow Auto Sales of South Gate, Calif. The FTC is also taking action against a 10th dealership, Courtesy Auto Group of Attleboro, Mass. The FTC said the dealerships in this case made several "misrepresentations" in print, Internet and video advertisements that violated the FTC Act, falsely leading consumers to believe they could buy cars for low prices, get low monthly payments through financing and/or make no upfront payment to lease vehicles. The FTC said one dealership sent out 30,000 mailers to consumers, saying they had won prizes they could collect at the dealership. But "not a single consumer, not one," won any prize, Rich said. Fowlerville Ford was the only dealership cited for advertising prizes. The dealership said it agreed to a settlement with the FTC over allegedly deceptive ads because "the cost of appealing" the FTC's conclusions "would have been prohibitive." "Fowlerville Ford has prided itself on maintaining the highest possible standards in treating its customers and in complying with all laws and regulations in conducting its business," the dealership said in a statement e-mailed toAutomotive News. Under the settlements, the dealerships concerned will be barred from deceptive advertising practices for 20 years. Any violation of that agreement could bring a fine of up to $16,000 per day. So if a dealership runs a deceptive ad for 10 days anytime until 2034, the potential fine is $160,000. "We hope that these actions," Rich said, "really put all dealers on notice" that violating the law will have "significant consequences for them." Rich said third-party vendors who help create these kinds of deceptive ads could also be subject to liability depending on how involved they were in creating the content. Rich declined to say how long the FTC had been investigating the dealerships, but noted that typical FTC investigations run "several months to over a year." Norm Reeves Honda Superstore, which was the top-selling Honda store in the United States in 2013, and Honda of Hollywood allegedly violated the FTC Act by deceptively advertising that consumers could pay zero money upfront to lease a vehicle when in fact the advertised amounts excluded "substantial fees and other amounts," the FTC said. The ads also allegedly violated the Consumer Leasing Act and Regulation M by not disclosing certain lease-related terms, the FTC said. Norm Reeves Honda Superstore's ad also allegedly violated the Truth in Lending Act and Regulation Z by not disclosing certain credit-related terms. Norm Reeves Honda Superstore in Cerritos, Calif., said in a statement that it cooperated with the FTC during the agency's investigation. The dealership, which was the top-selling Honda store in the United States last year, also said it will seek to ensure transparency in every aspect of its business. The dealership said that it committed an oversight when it used, in an advertisement that ran last March, a standard disclosure template that made the lease offer unclear to consumers. In the statement, the dealership said that the settlement with the FTC has led to enhancing the dealership's advertisement review process. "We applaud the efforts of the FTC," the dealership said in its statement, "and sincerely believe that their actions will ensure a level playing field for all dealerships." Phone messages left seeking comment from most of the other dealerships involved in the settlements were not immediately returned. One dealership, Rich said without naming it, made "deceptive lease trades" with zero down. "But guess what? There were fees, down payments and taxes, in one case totaling more than $5,000 all buried in the fine print," she said. Dealerships can avoid violating the law by simply posting accurate prices available to all consumers and avoiding fine print, Rich said. "Dealers think that if they put the real price of something in really fine print, that's not deceptive," Rich said. "That is deceptive and it violates the law." Here are specifics of the charges against the other dealerships, according to the FTC. Nissan of South Atlanta allegedly violated the FTC Act by deceptively advertising that consumers could finance a vehicle purchase with low monthly payments when in fact the payments were temporary "teasers" after which consumers would owe a different amount. The ads also allegedly violated the Truth in Lending Act and Regulation Z by failing to disclose certain credit-related terms. Infiniti of Clarendon Hills allegedly violated the FTC Act by deceptively advertising that consumers could pay nothing upfront to lease a vehicle when in fact the advertised amounts excluded substantial fees and other amounts. The ads also allegedly violated the Consumer Leasing Act and Regulation M by failing to disclose certain lease-related terms. Infiniti of Clarendon Hills told Automotive News today that it cooperated with the Federal Trade Commission during the agency's investigation and a settlement unveiled today regarding deceptive advertising by nine dealerships nationwide. The FTC's investigation focused on the sale, financing and leasing of vehicles. "We committed an oversight when we used the term 'no money down' in our ads, when the FTC does not consider collecting licensing, taxes and other fees to be no money down," Infiniti of Clarendon Hills Executive Manager Peter Korallus said. "We have since changed the ad and will be more diligent in the future. 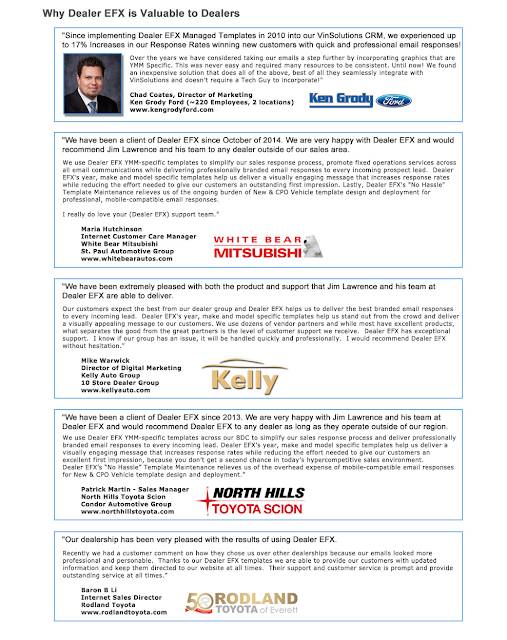 We applaud the FTC for their efforts and believe that they will ensure a level playing field for all dealerships." Paramount Kia allegedly violated the FTC Act by deceptively advertising that consumers could finance a purchase with low monthly payments when in fact the payments were temporary "teasers" after which the consumer would owe several hundred dollars more. The ads also allegedly violated the Truth in Lending Act and Regulation Z by failing to clearly and conspicuously disclose certain credit-related terms. Fowlerville Ford allegedly violated the FTC Act by sending mailers that deceptively claimed consumers had won a sweepstakes prize when in fact they had not. Some of their ads also allegedly violated the Truth in Lending Act and Regulation Z by failing to disclose certain credit-related terms. Southwest Kia companies allegedly violated the FTC Act by deceptively advertising that consumers could buy a vehicle for specific low monthly payments when in fact consumers would owe a final balloon payment of more than $10,000. The companies also allegedly deceptively advertised that consumers could drive home a vehicle for specific low upfront amounts and low monthly payments when in fact the deal was a lease and they would owe substantially more upfront. The ads also allegedly violated the Consumer Leasing Act and Regulation M by failing to disclose certain lease related terms, and the Truth in Lending Act and Regulation Z by failing to disclose certain credit-related terms. Casino Auto Sales and Rainbow Auto Sales allegedly violated the FTC Act by deceptively advertising that consumers could buy vehicles at specific low prices when in fact the price was $5,000 higher. Both dealerships used a mix of English and Spanish in their ads. The settlements -- which are not final -- involve proposed consent agreements that prohibit the dealerships from misrepresenting in any advertisement for the purchase, financing or leasing of motor vehicles, the cost of leasing a vehicle, the cost of buying a vehicle with financing or any other material fact about the price, sale, financing or leasing of a vehicle. In some cases, the proposed consent orders also require the dealerships to clearly and conspicuously disclose terms required by these credit and lease laws. Fowlerville Ford also is prohibited under the proposed order from misrepresenting material terms of any prize, sweepstakes, giveaway or other incentive. The commission voted unanimously to accept the packages containing the nine proposed consent orders, the FTC said. The agreements will be subject to public comment for 30 days, beginning today and continuing through Feb. 10, after which the commission will decide whether to make the proposed consent orders final. The FTC's administrative complaint against Courtesy Auto Group also was approved unanimously by the commission. It alleges that Courtesy Auto Group violated the FTC Act by deceptively advertising that consumers can lease a vehicle for no down payment and specific monthly payments when in fact the advertised amounts exclude substantial fees. The ads also allegedly violate the Consumer Leasing Act and Regulation M by failing to disclose or clearly and conspicuously disclose certain lease-related terms. The issuance of the administrative complaint marks the beginning of a proceeding in which the allegations against Courtesy Auto Group will be tried in a formal hearing before an administrative law judge. Editor's note: Earlier versions of this story had the incorrect name of the FTC sweep. It is called Operation Steer Clear. Sean Gagnier and James B. Treece contributed to this report.